The Foundation supports and empowers rural water and wastewater utilities and the communities they serve by developing innovative, collaborative programs that provide resources and build the capacity of utilities to best serve their customers. Put your money toward a good cause and donate today to help us fulfill our mission to support and empower rural water and wastewater utilities! The Texas Rural Water Foundation is a 501(c)(3) tax-exempt nonprofit organization established in 2010 as a supporting organization of the Texas Rural Water Association (TRWA). The Foundation was established by TRWA in order to expand upon the work of the Association. Our Mission: To strengthen and advance the water and wastewater industry and to support and expand on the work of the Texas Rural Water Association. Our Vision: TRWF strives for a well-respected and sustainable water and wastewater industry that has the support, workforce and resources necessary to serve their communities. AmazonSmile is a simple and automatic way for you to support TRWF every time you shop at no cost to you. When you shop at smile.amazon.com, you will find the exact same low prices, vast selection and convenient shopping experience as Amazon.com, with the added bonus that Amazon will donate a portion of the purchase price to TRWF. Salvage your scrap metal to support the rural water and wastewater industry! 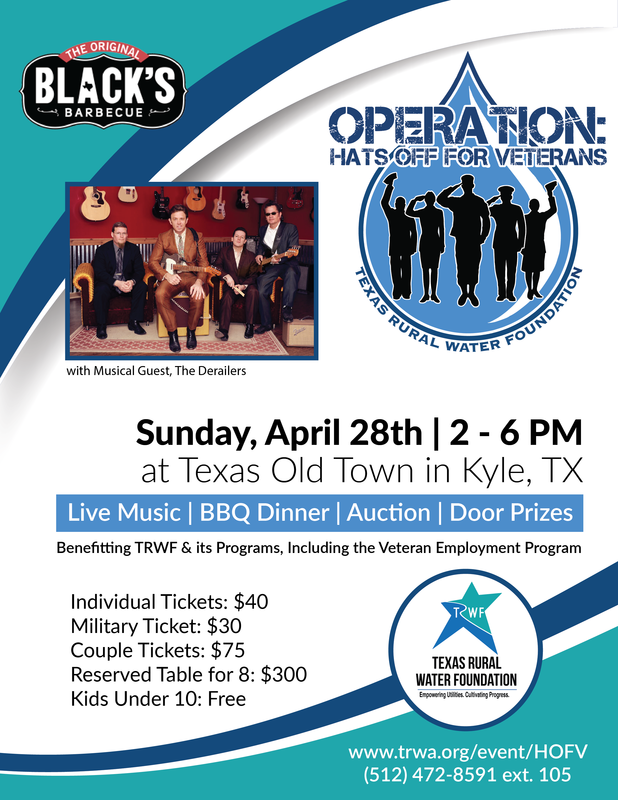 Make a contribution to help TRWF empower veterans, utilities and scholars. The goals of the Texas Rural Water Foundation’s Rural Water Workforce Initiative are to promote the rural water industry as an attractive and accessible career path to new audiences. The Initiative will increase the industry’s visibility to current and future job seekers by acting as a resource and facilitator in connecting job seekers with hiring utilities. The Veteran Employment Program (VEP) was created to inspire and mobilize new interest and talent to work in the rural water and wastewater industry. More specifically, the VEP addresses this objective to create sustainable outreach, and a recruitment and vocational program that focuses on training and retaining new employees for the industry.